Having decided to engage Pakistan on issues beyond terror, it is counterproductive for India to artificially limit the subjects it is willing to discuss. Future diplomatic historians will, no doubt, tell a more complex story but the broad outlines of External Affairs Minister S.M. Krishna’s less-than-successful visit to Islamabad seem clear enough. Having hosted Home Minister P. Chidambaram three weeks back and heard firsthand from him exactly what India wanted on the terrorism front, the Pakistani side’s expectation from the foreign minister-level meeting was that there would be discussion and, presumably, some agreement on a wider set of issues. In the run-up to the meeting, Indian officials, too, had let it be known that they were looking at a range of subjects like trade and people-to-people contact as a way of building trust. When he arrived in Islamabad, Mr. Krishna said India was ready to discuss all outstanding issues. The irony is that these issues — Jammu and Kashmir, peace and security, Siachen and Sir Creek — are subjects India and Pakistan have wasted several years of formal dialogue over without either side budging one bit. For example, Indian soldiers remain firmly perched upon the Siachen glacier’s commanding heights despite officials from the defence ministries of India and Pakistan having held several rounds of talks. Many more rounds can safely be held without our jawans being required to come down by even one metre — if that is what the government wants. Given the long-standing deadlock over proposals for verification of a mutual withdrawal, the Pakistani side knows nothing would be gained by yet another meeting of defence secretaries. But the civilian government which is struggling to assert its authority against multiple power centres within and even outside the ‘establishment’ needed something to show for its diplomatic exertions. The Indian delegation, however, did not come to Islamabad with a mandate flexible enough to accommodate the need for these kind of harmless optics. Worse, their limited mandate was undermined from within by Union Home Secretary G.K. Pillai’s accusation that the Pakistan state — with which Mr. Krishna was going to sit down and have talks — had planned the November 2008 terrorist attacks in Mumbai. Pakistani foreign minister Shah Mahmood Qureshi was undiplomatic in mentioning Mr. Pillai’s unhelpful remarks in the same breath as Lashkar-e-Taiba chief Hafiz Saeed’s inflammatory speeches against India. But people on the Indian side need to ask what the home secretary hoped to achieve by saying the Inter-Services Intelligence directorate of the Pakistan army had been involved in 26/11 “from the beginning till the end.” Indian investigators had questioned Lashkar operative David Coleman Headley well before Mr. Chidambaram and Mr. Pillai held talks with their Pakistani counterparts in Islamabad last month. One can only presume this question of ISI involvement “from the beginning till the end” was raised by them with Rehman Malik. Three weeks have elapsed since the Home Minister made that statement. Is that time enough to form a judgment on Pakistan’s “seriousness”, let alone decide to gut the possibility of its cooperation by making a public accusation of state complicity? At stake is not the veracity of Headley’s information — though it is worth asking why the statements of a terrorist who helped attack Mumbai in order to get India and Pakistan to go to war should be taken at face value — but the utility of levelling a serious charge in public. Did Mr. Pillai or his advisers do a cost-benefit analysis beforehand and conclude that blaming the ISI in this manner on the eve of the foreign minister’s talks would make Pakistan more likely to address India’s concerns about terrorism? If Mr. Pillai’s comments on the ISI betray a failure of the government to think strategically, the decision to postpone any front-channel discussion on issues like Siachen and Kashmir till there is greater “trust” is also deeply flawed. In politics, the default option is often the easiest one to take. Having suspended the composite dialogue in the wake of the November 2008 terrorist attacks in Mumbai, it would have been quite simple for Prime Minister Manmohan Singh to keep the dialogue process under suspension indefinitely. There would be no need for him to explain anything to anybody. But just as Atal Bihari Vajpayee had the courage to invite Pervez Musharraf, the architect of Kargil, to Agra in 2001, or to travel to Islamabad in January 2004 despite cross-border terrorism not ending, Dr. Singh was brave enough to say that not talking to Pakistan indefinitely was a bad option. The Prime Minister showed enormous political courage at Sharm el-Sheikh last year and againt at Thimphu in making a case for engagement. He knew full well that his decision would run against the grain of both hawkish political sentiment and the risk-averse attitudes of the security establishment. But in a concession to these quarters, his advisers came up with the constraining formula of ‘incremental dialogue’. In the wake of the acrimony that Mr. Krishna’s visit has produced, the government’s critics in the opposition and the ‘retirati’ are likely to say Dr. Singh was wrong to try engagement. That would be an incorrect conclusion. Thursday’s fruitless talks and the rather churlish comments of Mr. Qureshi since then are not the product of dialogue and engagement but of the half-way house that Indian officials have parked themselves in. Dr. Singh was bold enough to steer India away from the rigid position of no dialogue but he should have been bolder still in recognising that indulging Pakistan’s desire for official talks on Kashmir, Siachen and other ‘core issues’ would cost India nothing and would actually be a cheap way of moving the CBMs process forward. India’s current rigidity on this question is counter-productive. No doubt Dr. Singh is wary of how a more open attitude towards the resumption of dialogue would play. All democracies — and many non-democracies — have to worry about public opinion. But in this particular case, the burden of good optics weighs much more heavily on the civilian government in Pakistan than it does on the UPA government in India. If India looked at the problem strategically, it would recognise the importance of not allowing jihadi and extremist forces in Pakistan to depict the civilian government as an entity which meekly surrenders to Indian positions. Anti-Indianism is the glue that the terrorists and their backers in Pakistan use to bond with a public which is otherwise under daily attack by them. The creation of a dialogue structure which allows the Pakistani side to hold its head high domestically against extremists of all hues is what India should be striving for, especially at a time when the attack on the Data Ganj Bakhsh shrine in Lahore has outraged the Pakistani people. Mr. Qureshi may have been abrasive and tactless in many of things he said but his remarks on Balochistan and Kashmir and even infiltration (‘deal firmly with them and we will back you’) led hawkish journalists to attack him as pro-Indian. India is dealing with the complexity of a sharply divided Pakistani establishment and society. It should resist the temptation of matching Mr. Qureshi’s desperate grandstanding and instead think deeply about how the process of engagement which has started can be broadened and deepened. We do not need peace , have a iron clad IB/LOC and open the rest of state for settlement from all other Indian states…just like china does in xizang and tibet , its a proven formula for 'peace' . Some will cry let them , eventualy they will move on or become irrelivant, either problem solved. Which ever party does this will rule india for a long time. As for pak pan-islam is in the DNA of pak and nothing can change that other than break it up. i still can't understand how blaming a intelligence agency can offend a government. all intelligence agencies get involved in such kind of activities. RAW was accused of, if not of same gravity of 26/11, bombing in blochistan by pakistan. even RAW was responsible for helping LTTE during Indira Gandhi period and during Rajiv period was guilty of under estimating LTTE power and intentions. should india or its external minister get offended when somebody comments on it and forget the purpose and walk away. don't know if its correct but i am of the opinion spy agencies do thing that don't align with the policies of the country for which it works. @kaakaikuruvi Agreeing to talk on Siachen is not the same thing as “conceding siachin to pak” unless you have an extremely low opinion of the negotiating skills of Indian officials. That said, there is need for a rational and verifiable settlement there, so that troops can both sides can come down from the icy wastes which are of no strategic significance. @Sudhir There were concrete issues and demands raised by Chidambaram stemming from Headley's interrogation. That was just three weeks before Pillai's charge. If Pillai had stuck to asking “what action has been taken”, I would have no objection. Had the CCS and NSCS and others who make these asessments concluded that making a direct charge against ISI will improve the situation, I would have had no objection to Pillai saying what he did. But please trust me when I say, given my close interaction with folks in government, that Mr. Pillai was on a solo flight. The irony is that there was no grand design on his part; he just got carried away. Read the full transcript of the Indian Express ideas exchange and you will come to same conclusion. Qureshi mentioned Hafiz Saeed and Pillai in the same breath and Indians correctly got angry. Don't you think Pakistanis will get angry when Pillai accuses their government of direct involvement in a major terrorist attack like 26/11? In diplomacy, shouting in public is usually not a very effective way of making headway. Qureshi behaved like a boor, not a diplomat. Krishna handled himself well, so did Nirupama Rao. But Mr. Pillai, alas, he does not understand diplomacy. Which is why he should not be commenting on issues which belong to the MEA to speak about. Multiple Dossiers, and multiple reminders have not stressed on “exactly what India wanted on the terrorism front”? Why make it sound like we just asked for action three weeks ago, and therefore unreasonable to expect answers from them? We did ask before too, right? What have been the results of those demands? Is it too much ask for what action has been taken, or is that what peaceniks like you would classify as hawkish? 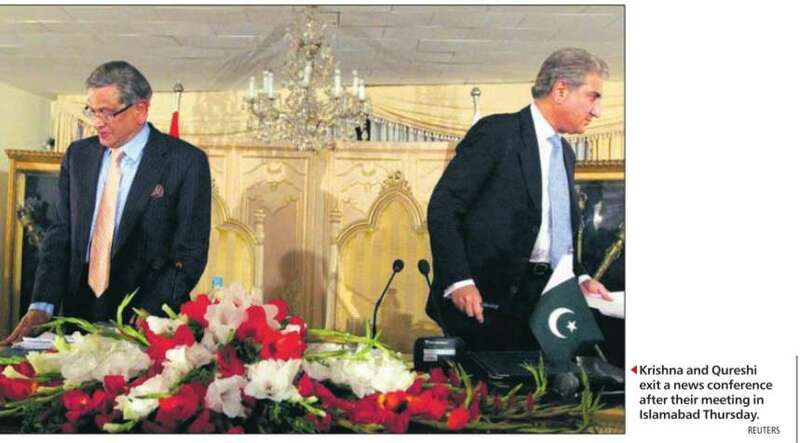 This is not the first time that Qureshi has used language unbecoming of a Foreign Minister. Yet, somehow we are expected to swallow all such insults and go ahead and try to engage with them. a good, logical analysis. but i just want know if you are hinting india should concede siachin to pak?? i am not a army or security expert, but i know siachen is a important strategic/vantage point. what does it mean to include siachen in the talk?? if included pak will claim it. and should we give it?? if we refuse it will lead to confrontation again. then i don't understand your complaint against Mr.Pillai. would you hold account a pak official who blames indian raw. though intelligence are part of country/govt. their action/functioning comply with policy of the govt. they don't have rules. recently US held some 10 russian spies, did that affect the relation between the states?? This entry was posted on July 17, 2010 by Siddharth Varadarajan in Indian Foreign Policy, Pakistan.